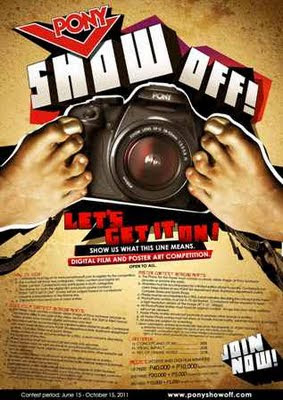 Pony Show Off Digi-Art Contest ~ Philippine Freebies, Promos, Contests and MORE! Pony, an American brand of footwear has been worn by champion athletes in the World Cup, Super Bowl, NBA and the likes. It's influence thrives on breaking customs and revolutionary attitude, Through a Show Off digital art competition, they hope to capture the user's fighting spirit and energy. All rebel designers and visionaries are encouraged to join and boast their talent in interpreting Pony footwear's tagline “Let’s Get It On” using two (2) categories: Digi-Film and Poster contest. Cash prizes at stake are P40,000, P20,000, and P10,000, plus Pony products. Display your creativity and let those visual geniuses out. This might just be the beginning of a new generation finally taking over. Photo/Poster entries must be in 72 dpi format. "Upon submission, entries automatically become the property of PONY footwear"